This was a bad decision. To understand, a quick remedial Upper Fort Garry lesson is required. In 2007 Crystal Developers signed a deal to build a high rise apartment building between Fort St. and Main St. north of Assiniboine Ave. When it was discovered that the building would partially overlap the foot print of the historic Upper Fort Garry, there was public outcry that prompted Crystal to redesign the whole project so that the area of the old Fort (that is … the area that’s not already paved over by streets and other buildings) would be protected. Then along came the Friends of Upper Fort Garry, the many of whom are members of the nearby Manitoba Club, and their campaign to topple the residential development. It it’s place, they planned an elaborate interpretive centre for UFG. With the aid of certain people in the media, most notably Gordon Sinclair of the Winnipeg Free Press, the Friends launched a campaign of misinformation to “SAVE THE FORT”, which as I explained two paragraphs ago, had ALREADY BEEN SAVED by the developer. Nevertheless, the campaign gained traction. Premier Gary Doer got on board, school children turned in their piggy banks to “save the fort”, and the mayor Sam Katz, who told me personally that this campaign was ridiculous, had his arm sufficiently twisted to change his mind and support it. Eventually the developer agreed to back out of the development because the pressure, both public and behind closed doors. This project represents the worst of everything in Winnipeg: a developer getting screwed around by the city, last minute knee jerk decision making, back room politics, and ultimately a great deal of wasted money — both in terms of money spent and opportunity cost — that will ultimately cost taxpayers millions upon millions of dollars. Oh yeah …. and SURFACE PARKING LOTS. The project was initially supposed to cost $12.5 million, but in the ensuing 7 years the tally has ballooned to $28 million, with $15 million yet to be raised. About $13 million of that is to build the interpretive centre that is supposed to occupy the parking lot that was originally going to be a high density apartment building filled with money-spending, tax-paying students and workers adding density to downtown and making the streets safer. Now, in May of 2015, the amount of money the Friends need to raise to develop this parking lot is equivalent to the initial cost of the entire project. This is one reason why it was a mistake to approve the Friends’ request to turn that empty space into a formal but “temporary” surface parking lot: because it is not temporary. There is no prospect of this interpretive centre getting built without a massive injection of government money. The city is suffering from donor fatigue from relentless fundraising for the Canadian Museum for Human Rights and many other worthwhile causes. The Friends will have their hands full just trying to fund the complex lighted heritage wall that is to frame the current park. foundations with other commemorative and interpretive installations throughout the park.” –link– In addition, the heritage wall will be capable of depicting and describing anything the Friends wish to depict and describe about the bygone era of UFG. We are already blessed with excellent interpretive facilities of our fur trading and Métis past, including Fort Gibraltar and Lower Fort Garry. What the Friends have planned for the parking lot will add little value. 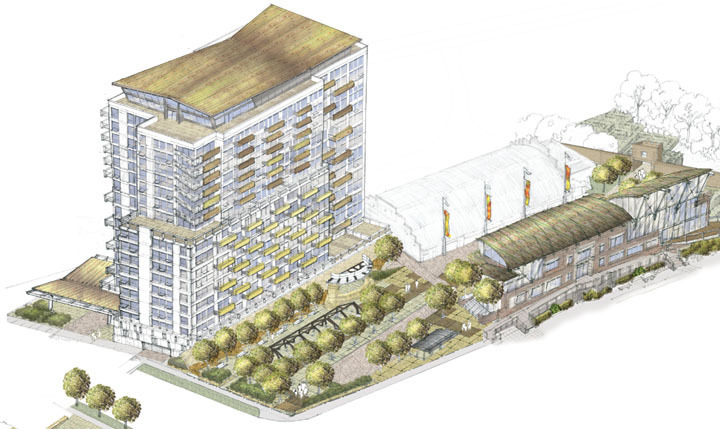 – The city has a moratorium on new surface parking lots. Exceptions have already been made to support specific business growth or reconfiguration, and now an exception has been made to raise money for an over-budget park sponsored by a select group of rich Winnipeggers. This watering down of the city’s ban on surface parking lots makes the moratorium essentially meaningless. – Any potential development of this empty space will be delayed by another 2 years. Assuming the Friends will fail to raise money to build the interpretive centre, which is an exceedingly safe assumption, something will need to happen with this property if it is not to remain a surface parking lot forever. That means some kind of development, potentially like the apartment building that was killed 7 years ago. The decision to grant a 2 year parking lot exemption means no meaningful decision will be be made about the future of this site for another 2 years, which means more foregone property taxes. These are all, in my mind, excellent reasons for rejecting the request by the Friends of Upper Fort Garry, and reasons why the councillors who voted in favour of the request made the wrong decision. However the biggest reason is simply this: it supports a project that represents everything that is wrong with development in Winnipeg. Backroom politics, wasted money, over budget projects, and 11th hour decision making based on influence and not merit. If the Friends of Upper Fort Garry need to raise money to complete their project, they already have a very reliable source: their bank accounts. Do not pine for the devil you do not know. Crystal Properties is evil in the highest sense of the term, anyone who has had dealings with them will tell the same story. They might put up fancy apartment block with their own money, but after a few years no one would want to live there cause they nickel and dime their tenants to death. The city would end up with another Crystal slum on the main drag that tourists would avoid like the plague. Do you have a bad experience with them? If so, how do you know it’s not isolated to one bad property manager?